If you are a Domain Name investor or regular visitor of GoForTricks then there is basic need to know about Domain Name and URL basics like what is URL and How domain name is related to URL. A Domain Name is the part of the URL. Some website have high security to access they use HTTPS these websites can be of banking sector and University sites etc. While SMTP is a protocol used for mailing service. FTP stands for File Transfer Protocol used access the server file through which you can download and upload the files into the server. The semi colon or “:” define the two separate division of a URL. The term before the semi colon is Protocol Identifier and after semi colon is Resource Name. xyz denotes the directory name while lies in the server and from which we need to fetch the information. “stbhd.htm” represents the webpage in which “stbhd” denotes the name of webpage while .htm denotes the extension of the file name “stbhd”. .htm is the extension used for the HTML files. There are many other extension also available .php, .asp, .xml and .cgi. as you can see in above example there is ? in the middle of URL. This ? divide the URL from the parameter. P is the variable name and “example%20search” is the value that is being loaded into the variable P in which “%20” denotes the space. “&” separate the two variable because “example” is the second variable there. CGi-bin is the director name mentioned in URL. (2) You can use dashes in your domain name while no any special character is allowed. (3) Domain name can be 63 character long. (4) Domain name is not a case sensitive because www.gofortricks.com and www.GoForTricks.com gets you same destination. 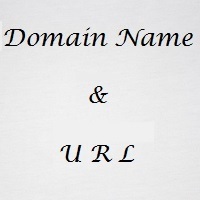 (5) You can use Numeric Domain Names and Alphanumeric domain names too. mail.gofortricks.com can be used for mailing services for gofortricks.com and also a blog.gofortricks.com can be used for blog of gofortricks.com and so on. In this mail , blog and stuff are the known as the sub domain of the gofortricks.com.